Giampaolo Tabarrini is the 4th generation family proprietor and winemaker for Tabarrini vineyards in Montefalco, Umbria. About a month ago, I had the pleasure of sitting down with Giampaolo and discussing his family’s passion for Sagrantino, and Montefalco as a whole. Giampaolo, thank you so much for speaking with me today. Grazie Giovanni, grazie. It is my pleasure to talk to you. Who founded the Tabarrini estate? I don’t know exactly when my family started everything on this estate that still surrounds me today. My great-grandfather Pietro is the first of which we have found offical documents, but my father remembers that also his great-grandfather was doing the same, so maybe even one more generation. Of course they had olives, cereals and animals too … But at this time family was really huge, and there were a lot of employee and a lot of mouths to feed at the table. Your family has made wine for generations in Umbria yet you only took control of the property during the late 1990’s and only then began bottling your own wine for sale commercially. That’s just a bit more than 10 years ago which makes Tabarrini a relatively new producer of Sagrantino. What did your family do with their grapes before that? Were they sold? And if so, why did you decide to change that? Until 1995 my father and my grandfather were selling the wines in bulk to the local people and the largest amounts to wine merchants coming from France and Luxembourg. My family trusted the tales of those merchants when they were telling them that the wines were meant to be sold in restaurants in their own country. Of course that wasn’t possible because they used to get something like 300-400 hectoliters (8,000-10,000 gallons) of ready-made wine per visit! Those can’t be quantities for just a few restaurants! Mine was a family of farmers who never saw the big cities in their lives, that’s why they trusted them. I suppose that our wine was then bottled by other wineries…..
That had to be frustrating….the sense that your family’s efforts were being misrepresented as someone elses’s. It was. Any time that you find your trust has been taken for granted, it’s frustrating. Even more so when you work as a family. When you love your labor. So after 1995, you stopped those overseas business relationships? Exactly. In 1996 my father sold me the company and then in 2000 gave me the property. It was then that I stopped selling the wines in bulk and started to age them in wood. Soon after, I began to bottle. In 2000, I started to dream about my new cellar and that dream became reality because we finished building the cantina in 2004. A few years later, I made room for the hosting of wine tourists. In 2010, I started to dream about retailing from my cellar and about enlarging it’s space… But not in order to produce more wine, just because the more space we have the better we can work. The future is yet to be written!!!! Sagrantino doesn’t seem to garner the level of respect or attention that it’s DOCG counterparts attain. I think that’s a shame. Do you agree that it is underappreciated and why do you think that is? Knowledge comes from promotion. Only 800,000 people live in Umbria so this entire region has ¼ of the population of Rome. It’s not a big region, but you see it’s still a very low-key life, low-key density, low-key whatever kind of region. It happens that the State shares the money to sustain the territories for functions of the people that live inside them. That means that we don’t have enough money to promote our beloved Umbria. I think that my territory hasn’t the right drivers, so it’s like a Ferrari driven by someone thinking he is driving a Fiat 500. The Sagrantino production zone is very small, with only 250 acres to the entire appellation. It’s also one of the newest zones to be promoted to DOCG, which occurred in 1991. Do you think the small size is detrimental or beneficial to Sagrantino achieving world class status? Of course the first way to let the people know is to let them taste. Like they say there are good conditions today to spread the jam. The other main trouble is that quality Sagrantino wines aren’t so many and most of the producers are coming from other situations. Knowledge of the raw materials should be the very first thing! But of course some of them don’t know what that means. About 10 years ago many growers sold their lands because of very high offers. Today truly local producers are not so many, maybe only 6 or 7 wineries. Most of the others have another philosophy. They are wineries who work after planning their budget. We are not doing the same job. It looks the same but it’s not!!! Promoting their wine is not like promoting mine. Anyway I’ve decided I’ll only make the wine and let it be tasted by the people all around the world… and regarding how to solve the marketing question, it’s something that I tried to do when I was 25, but now I don’t want to care about it anymore. I only want to make my wines and let them be tasted. Nothing more! I want to make better and better wines, I want to solve the troubles by myself and I don’t want to lose the battle for promotion because of the politics of the consortium or of the big wineries. That is not my job! Those statements are exactly what lovers of your wine want to hear. They scream of passion and commitment to quality. For me there is no other way. I found this statement on your website: “Se guardo indietro, vedo il futuro.” Or… Looking back, I see the future. What do you mean by this? I see, ok. So the future is unwritten but the foundations by which you seek to improve have been rooted in your family’s past. This is true. I can only improve going forward based upon what my family has taught me….taught all of us. Tabarrini makes a wide variety of wines, arguably your three stars are the Sagrantino: Colle alle Macchie, Campo Alle Cerqua, and Colle Grimaldesco. All three are bottled as single vineyard wines. Why do you bottle them separately? What makes them distinct? That’s a long story. I always had separate vineyard fermentations and then had blended the wines into one. But then in 2002 I decided to stop blending them all together. Why? Are the vineyard sites that unique? Oh yes, si. Absolutely! Why? Because I love wines like Barolo, because I know the differences between one vineyard and another. It’s unbelievable because my lands are all on the South side of Montefalco, but the different soil textures, the altitudes, the sun exposures really make a large difference. Then aging the different Sagrantinos in different kinds of wood increases the wine assortment. One works better in large casks, another in barriques, and another in a mix of them both. It often happens that I play with my importers and I let them taste the wines from the barrels. The same wine but aged in different wood … They understand how the wine can change in a different wood container. After that I can say that the job has become much easier for me, because blending is no longer needed since I have started making wines from single vineyards. Of course there are some troubles too, because people keep asking which is my best Sagrantino – and I have my own favorite among the three – but there is no best one! So that begs the question then, which is your favorite of the three vineyards and why? Also, can you generalize the nature of each wine for my readers? Is one more masculine, one more feminine? Vigna Colle Alle Macchie: If my wines are said to be bold and extreme, this one is even more radical. It’s the bare essentials. Stripped, authentic, true, indigenous Sagrantino showing all the potential of the grape. It tells all the truth and only the truth about our land. Solid, dense, dry, full bodied and confident. Soulful. 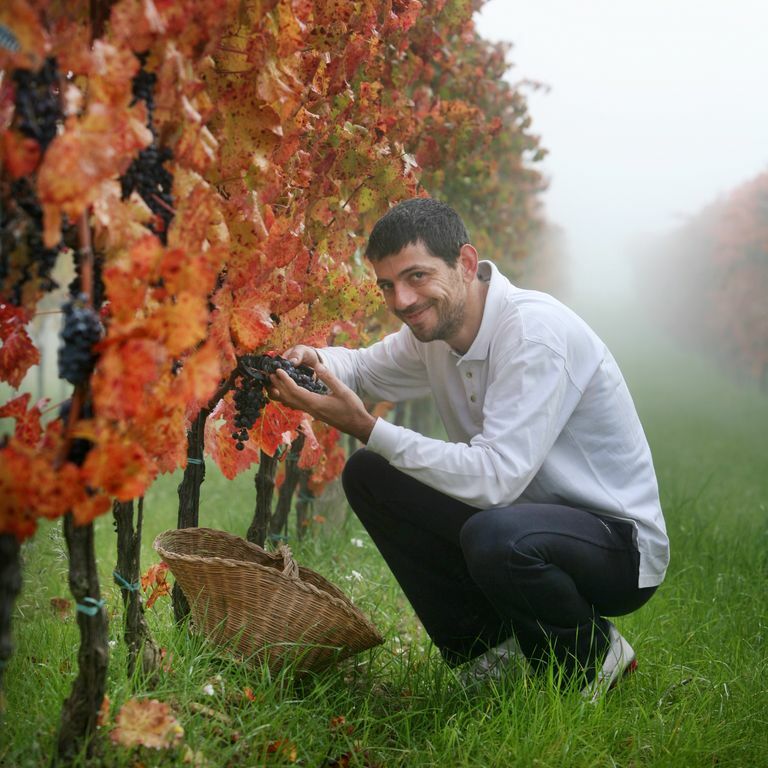 Vigna Campo Alle Cerqua: Smoother, the most feminine; more experimental and mineral. Fresh, fruity and sought after. Probably not the most traditional Sagrantino, but a really elegant version. You won’t find something similar in Montefalco. The most elegant and feminine of the three. Vigna Colle Grimaldesco: The wine has his own soul and it’s the oldest vineyard of the three. It is some kind of meeting point between Macchie and Cerqua. It’s classic Sagrantino, probably what you would expect from a Sagrantino. Very rich in bouquet. Very aromatic. The Campo Alle Cerqua Vineyard on the Tabarinni Estate gets it’s name from the centuries old oak tree, pictured here, that dominates the landscape of the vineyard. 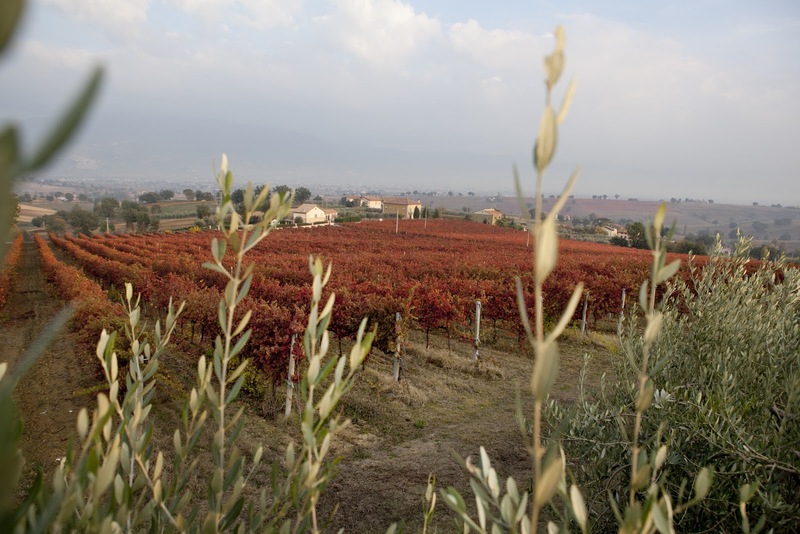 Have you considered producing a Sagrantino Riserva? What vineyard would you bottle it from? Sagrantino riserva doesn’t exist and the rules do not allow for making it. Besides all three of the different Sagrantino I produce are practically riserva wines, most especially the “Colle alle Macchie” which is aged 42 months in the bottle before its release date, so 6 years after the harvest. Colle Alle Macchie (planted 1999), Campo Alle Cerqua (2000), and Colle Grimadelsco (1992) are relatively young vineyards. Why were they re-planted? Are all three vineyards in full production now? Yes, all the vineyards are in full production now. The portion of Colle Grimaldesco we use for the Sagrantino label was planted in 1992. I only use the South-facing side of that vineyard for the Colle Grimaldesco label, all the rest is used for the Montefalco Rosso blend. Of course I harvest all three vineyards separately, so one by one usually in late October-early November. In the past, as we re-planted the vineyards, I chose to plant specific clones of Sagrantino, not the first one that you find at the shop. I noticed that our friend, Emiliano Falsini, is a consulting enologist for Tabarrini. I interviewed him recently regarding his work with Piaggia, in Carmignano. How does he assist you? What is his role at Tabarrini? Emiliano is a friend and we have been working together a long time. He is very professional and respectful. I’m not his easiest customer though. I make the wines and he tastes them at the very end of the process. He gives his opinion and I keep mine. We work well together because he knows that he is the consultant and I’m the winemaker. I respect him too and he does the same with me. For me he is the second opinion that I just need to start discussing my job and to find out how I can get a better wine. We talk a lot because I suggest my idea and he tries to match it with his technical knowledge of the enology. Your family’s winemaking philosophy has been described as: “Great wines grow only from a great love of the land. From the bunch to the bottle. The whole family follows this philosophy scrupulously and passionately through every step in the production of our wines.” That is a definitive statement. What are some of the steps you take that embodies this statement? What sort of characteristics related to your terroir are evident in your Sagrantino? A true wine of a territory is a wine where all the steps, from vineyard to bottle, are followed by the winemaker. You can’t trust anybody, but not because people close to you are bad, but just because there are some features on the vines that everybody can see, but many don’t notice. It may be the color of the leaves, or the conditions of the flowers, or the size and the aspect of the clusters… Only people who love vines, grapes and wines and participate and follow the process can understand the differences of those little details. Details are what makes the difference in the wines at the end!! I think I know your opinion on this next question, but do you think that great wines are made in the vineyard or in the cellar? Is the winemaker merely a custodian? Should he be a minimalist or an interventionist? I won’t be the first one to say this, but great wines come from the vineyard. If you have good lands, the right grapes and clones, if you take care of the vines and you’re able to understand the vines condition, if you support them and understand when the grapes are ripened, and if you are good at balancing the yield production with no stress for the vines, and as a result finally… if you get great high quality grapes… you’ll be very close to the target. So you’re saying that even though mother nature produces and cares for the product, a winemaker can still have tremendous impact on his wines even before a single grape is harvested? No question, yes. In fact, I think to be the best winemaker that you can be, you must do these things. You can leave nothing to chance. Once you have the fruit, then in the cellar we have to keep going forward. Nothing has been done! You have to clean the grapes, de-stem and check all the details, because it looks easy but the winemaker knows when there are dangerous moments and he works to avoid them. If we treat the grapes and musts with respect then at the right time, everything will happen naturally. After that it’s the personal taste of the winemaker and his knowledge of the wines he’s producing that can make the difference!!! Wine lovers debate constantly about the merits of new oak versus used oak, large botte, or small barrique. What is your stylistic trademark regarding oak influence in your wines? 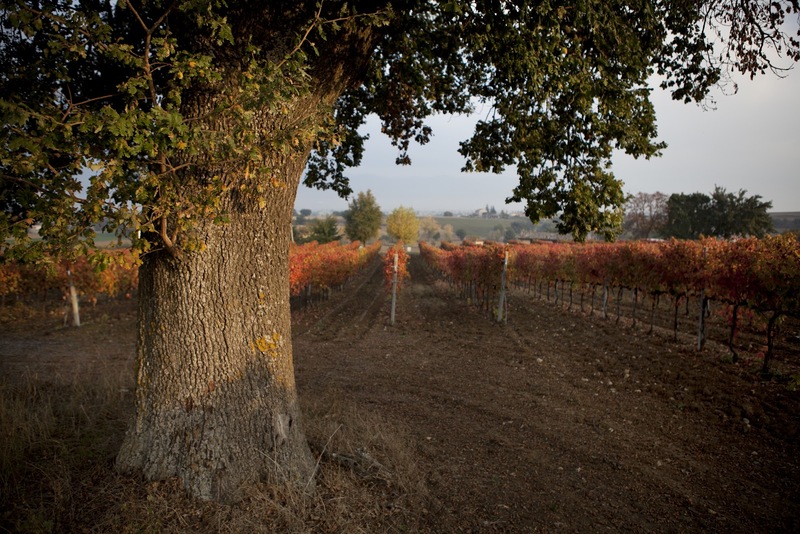 Do you think Sagrantino needs or benefits from extended oak aging? First of all, I think that wood is the best place for the wines. In my cellar all the wines (except for the white and the rosè ones) are aged in wood from 18 to 42 months. Regarding the discussion whether barrique or large cask is better, I think that all of them are the right choices. I will try to explain better. I use French oak coming from different forests (Allier, Tronçais, Nevers, Vosges) and I also have 15 big casks made with French oak too. I only like French oak. The same wine aged in different kinds of barriques and also in large barrels is going to evolve differently over time and taste differently at the end of the ageing process. Now, there are some vineyards that yield wines that age better in large barrels, other vineyards are better aged in barriques and others through the compromise of barriques and large barrels. The great thing is to blend the single vineyard wines in the glass, so realizing if Colle alle Macchie – that is aged only in small barriques – would turn out better if using x barriques from Allier and x barriques from Tronçais, x from Nevers, and x from Vosges and so on… I have blends in the glasses before doing the job in the tank and I try to balance the evolution that each barrique contributes to the ageing process. The richness is given by the opportunity to decide between many choices and by trying to use the experience to make the best glass of wine that you can!!! I age Sagrantino in wood for 42 months, so yes I trust in the wood. I’m not risking anything because this aging happened in the past and it will be right for the future. Your winery is clearly a close family operation. Let’s talk about your lovely wife for a moment. Your own website proclaims: “Her biggest fault is that she married Giampaolo.” It further states that she spends her time solving the everyday problems that you create. I’m laughing….can you elaborate on this? That’s priceless…Your website says of you: “Giampaolo describes himself as egocentric, a perfectionist, and an intolerant man. He is actually much worse. Working with him is a torture no one mentally sane would accept….” Did Emiliano Falsini write that? No, seriously though, while your self deprecating humor is charming – this statement is too critical, is it not? A journalist wrote all the texts. I didn’t suggest him anything. Of course he described all of us like we are, but in a funny way. I have to admit that everything is true! I want to harvest when I decide. Emiliano is always stressed with me because I risk a lot in this. I want the best wine, not a good wine! I’m not struggling hard to make something good, but to get the best that I can. Emiliano turns out being very happy when he comes taste the new wines in January. The stress goes away and he starts to smile, and many times he is impressed by the new wines and he feels like a child in a room full of new toys! That is my way to work. All under pressure until the end, and when the game is done, be relaxed and proud!!! You are the Fourth Generation proprietor to run Tabarrini. Your passion and enthusiasm for Sagrantino and Tabarrini are contagious. You’re an admitted perfectionist. What is the next step for Tabarrini? What are your long term goals for the estate? After Tabarrini Enoteca USA opened in 2010 I started to dream about my new cellar in Montefalco. More space, new concept, green building; services for the guests …. Other special facilities…It’s a dream and I want it. In the last 2 1/2 years I’ve always studied and designed new projects, like a fine suit but around my ideas. The project got the approval authority and the architect did a very good job, but after one of my last tours I got a new idea and so I’m changing some of the concept there… I’ll let you know when the dream comes true. Please do! I hope to visit the new cantina the next time I come to Italy. I ask this last question of all my interviewees. After you are done walking the vineyards, cleaning the cantina, and attending to anything and everything else that must be done, what does Giampaolo uncork when he goes home for the night? Not the wines of my territory. I’m lucky that many good producers are friends of mine, so I haven’t got to buy the expensive bottles because we usually exchange the bottles between each other. I like Barolo and Barbaresco a lot. These are my favorite wines in general. I also like some Brunello but much less than Nebbiolo wines. In Tuscany I like Montevertine and Isole & Olena (very good friends and winemakers). I like wines from Sicily too. Etna is very interesting and Passopisciaro, like Russo or Graci are friends of mine too. As for the white wines, I like a lot Riesling from Alsace (because they look like my Adarmando – a 100% Trebbiano Spoletino grape that’s becoming more and more revered in Europe – when they are both old. I like South-Tyrol wines and I also like wines from the Campania region, like Fiano and Greco. That’s what I like. About what I drink I can say whatever. I drink all the wines of known and unknown wineries. I like to try wines to understand more about them. My grandfather taught me that it is important to drink both the good and the bad ones, because only when you try the bad wines can you learn to recognize them and you are able to avoid going in the wrong direction. Il futuro è luminoso davvero! For sure the future will be gorgeous. Grazie tanto amico. I hope to see you soon. Ci vediamo Giovanni! Grazie e lei……. John, Giampaolo Tabarrini, wow! One of the best interviews I've read concerning a winemaker/vineyard. The photos are mysterious and enticing. Thank you my friend. Giampaolo is great and he will talk passionately forever! It was a lot of fun, and I look forward to continuing to speak to him and others – and to bringing more interviews to this site.